An investigation by World Animal Protection reveals major European airlines are enabling exotic pet trade, despite making commitments to combat wildlife trafficking. 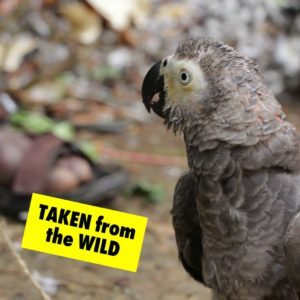 The airlines carriers have been used to illegally transport wild-caught African grey parrots on flights from Democratic Republic of the Congo (DRC), Nigeria and Mali to countries in the Middle East, western and southern Asia. Millions of wild animals including parrots are being captured from their habitats or born into captivity, to be sold into the exotic pet trade; a growing multibillion-dollar industry that’s having a devastating impact on wildlife populations across the world. Whether traded legally or illegally, keeping wild animals as pets is cruel. The journey they endure is perilous; tortoises, snakes and parrots are cruelly captured from the wild and sold to traders. They are stuffed in crates, often unable to breathe properly or move and most of these wild animals will sadly suffocate, starve or succumb to diseases before they even reach their new artificial home as a pet. Once they are in people’s homes, there is no realistic way to replicate the space and freedom these animals would have in the wild. Many animals are kept in spaces vastly smaller than their natural habitats and they don’t have the correct nutrition, even if owners have their best intentions to feed them properly. The research reveals that nearly one third of all wild animals die during transportation while a high number of pet snakes, lizards and tortoises die within the first year at home. With natural age ranges from 8-120 years, it is thought that these deaths mostly occur from stress-related illness in captivity. Edith Kabesiime, Wildlife Campaign Manager at World Animal Protection says:“Poaching animals for the exotic pet trade is happening on an industrial scale with devastating consequences. Worse still is that the illegal and illicit elements of the trade are often aided by government corruption and inadequate enforcement. “Animals suffer at every step of the journey destined to people’s homes: from capture to handling, transport, holding, breeding, sale and the lifetime of captivity in the home. “Shockingly, as recently as August 18, 2018, African grey parrots were transported by a major European airline between Kinshasa and Kuwait via Istanbul, with more than 60 found dead on arrival. Most people buy exotic pets because they love animals – but any wild animal in the exotic pet trade experiences extreme suffering. World Animal Protection is urging people to not buy, own or breed a wild animal as a pet. A life in captivity is a world away from a life in the wild. Wild animals are not pets, they belong in the wild. Join the movement to help end the cruel exotic pet trade and call on Turkish Airlines and Cargo to immediately cease flying all birds on their airlines.